Sziget - A Music Festival Of Epic Proportions. Considered one of the largest music festivals in Europe, the Sziget festival takes place annually in Budapest. 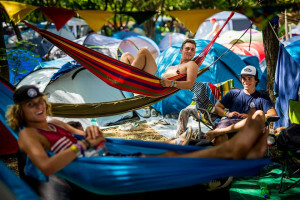 There’s just something about music festivals--a veritable melting pot of youth culture from around the world, brought together by nothing more than an insatiable appetite for dancing, art and concerts. The Sziget takes place on Óbudai-sziget, an island in the middle of the Danube River between Buda and Pest. Boasting more than 1,000 performances, the festival takes place over seven days in August and acts like a sort of village for the artistic and musically-inclined to converge. The island is transformed into another word with circus acts, chess tents, jazz stages, pubs, campfires, museums, villages and even wedding tents (should you shimmy up to your future spouse during one of the many shows). How To Do Sziget In Style. While camping is available on the island, if spending 7-days in a flimsy tent it not exactly your cup of tea, there are glamping packages available to give you that coveted Woodstock ambiance paired with the comfort of a sturdy home. The Sziget Music Festival--also endearingly known as the Island of Freedom--promises an experience where love, music and art reign supreme. One of the biggest music festivals in Europe. Set against the beautiful city of Budapest. Over 1,000 live acts across 7 days. Glamping packages available to rock out the festival in style.